At the of the 20 blocks, there's the water front. 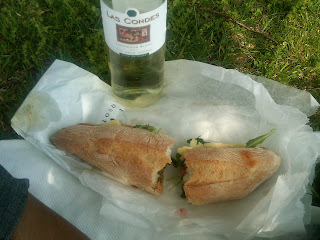 I was not alone in my idea about wanting to lunch under a shady tree while catching up on some reading with my iPod. Luckily at Founder's Park, there was plenty of green grass and shady trees to go around. Including a patch of sand to play volleyball and a small basketball court. Yes, that's an artist painting the landscape. His work came out pretty cool! After I settled under my tree, I pulled out my lunch, and spent the next two hours people watching until the wind picked up and the storm clouds starting rolling. It was definitely a relaxing Sunday and I know this will become a frequent thing as I enjoy my new city. Next time, I'll bring company to join me.